With all the network and duplexing features of the LaserJet 2605DN, the LaserJet 2605DTN also has extra paper capacity, and the ability to print directly from the popular photo flash memory formats. Looking at one of these things head-on, the Color LaserJet 2605DTN looks like a retro kitchen appliance. But on closer inspection, the 2605DTN weighs in at 52 pounds, has a 16” x 18” footprint and is about 14.5 inches high. The 2605DTN comes with two 250-sheet cassette trays, each capable of supporting a half-ream of 8.5" x 11” letter up to 8.5” x 14” legal paper. The first cassette also doubles as a multi-purpose tray. The 2605DTN also has a single-sheet priority slot for labels, single-feed envelopes, and transparencies. You can add a second 250 tray to double the LaserJet’s paper capacity, which can be easily attached under the LaserJet 2605DTN. The LaserJet will start printing from a cold start in 20 seconds. To achieve a 2400 dpi color resolution HP developed Image REt 2400--a technique where each dot in the native 600 x 600 dpi will have 4 colors. Think of it like having a whole pie then cutting it up into 4 smaller pieces. At the maximum resolution text is reasonably sharp, and photographs are very detailed with smooth color transitions. If you have CF, xD, SD, SmartMedia, MultiMedia, Sony memory Stick & Memory Stick Pro cards, the LaserJet 2605DTN can read directly from your card without the need for connecting to a computer or the camera. It’s like having your own private photo-developer kiosk. Unlike the 2600N, the 2605DTN comes with 64MB of memory—and it’s expandable up to a whopping 320MB, making the 2605DTN more than capable of handling the network printing demands of a department or classroom. Using a control panel with LED and a 2-line LCD display, it is easy to determine the LaserJet’s status and supply levels at a glance. Being a networked printer, you can manage it using any internet browser with HP’s included Web Server. 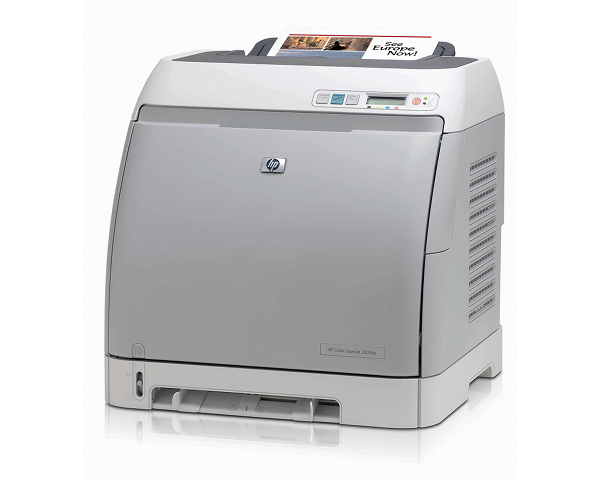 Office-ready, the LaserJet 2605DTN comes with PCL 6 and PostScript 3 emulation, plus 80 scalable TrueType fonts. By downloading the latest drivers from HP’s web site, you can avoid the software bug found where the printer would switch to custom paper sizes instead of the default. The download software also offers Windows 7 support. HP has links for UNIX/Linux support as well. If you’re used to the print speeds of inkjets and B&W laser printers, you’ll have to learn patience with the LaserJet 2605DTN. At 10 color pages per minute and only 12 ppm in B&W printing, this is no speed demon. Don’t expect to use this printer as your sole printer unless you like replacing toner a lot. 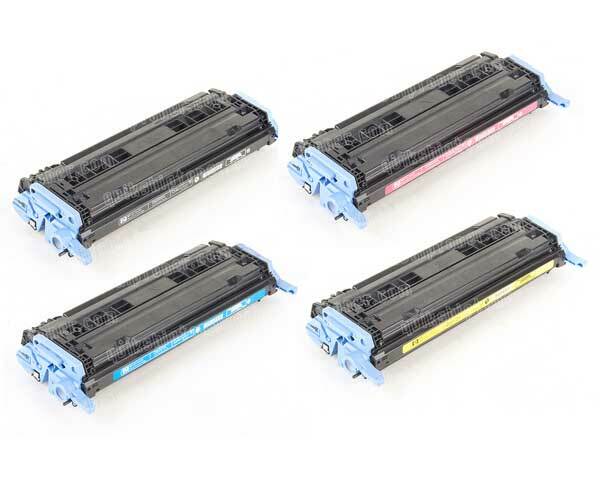 The small toner capacity roughly equates to having to replace at least 2 toner cartridges every half-case of paper. Adding the 2605DTN’s slow print speed will make you look into buying a faster monochrome laser printer for your main printing. 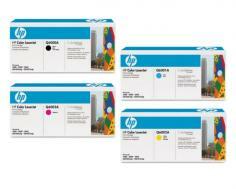 Review it: "HP Color LaserJet 2605dtn "
Out of the box, HP includes a standard yield 2,000-page cartridges. Since this is a duplexing printer, the yield is “per image”, rather than “per page”. Also, manufacturer’s toner yield specs are based on the always asterisked “5% ink coverage per page”. To give you an idea of what that means: a standard business letter uses 5% ink coverage; a newsletter 30%, and a print with graphics, text, and photos can exceed 60%. These cartridges can be purchased separately, especially since black and yellow toners tend to get depleted at a higher rate than the other colors. Combo-packages are available to save costs.